Honda will make the strongest showing at the Suzuka 8 Hours: 22 out of the 64 machines expected to line up on the grid are Hondas. The factory is launching a major bid to win back its home race in Japan, with HRC returning to the fray after a 10-year absence. L’article Honda launches bid to reconquer Suzuka est apparu en premier sur FIM EWC. Honda will make the strongest showing at the Suzuka 8 Hours: 22 out of the 64 machines expected to line up on the grid are Hondas. The factory is launching a major bid to win back its home race in Japan, with HRC returning to the fray after a 10-year absence. In July 2008, Dream Honda Racing’s Ryuichi Kiyonari and Carlos Checa won the Suzuka 8 Hours. That was the last time a factory Honda made an appearance at the race in Japan. In the years that followed, Musashi RT Harc-Pro Honda and F.C.C. TSR Honda France valiantly flew the flag for Honda with three and two wins respectively, but Yamaha Factory has staked sole claim on the Suzuka win since 2015. Last winter, however, Honda announced that its factory team HRC would be returning to the Suzuka 8 Hours. So all eyes will be on HRC’s CBR1000RRW #33. Honda has recruited a top-notch rider trio to reconquer Suzuka, including two HRC factory competitors in the Japanese Superbike series and MotoGP respectively. Takumi Takahashi, the 2017 Japan Superbike JSB1000 champion, is a three-time Suzuka 8 Hours winner. He will team up with Takaaki Nakagami, who rides for LCR Honda Idemitsu in the MotoGP, and won Suzuka in 2010. Last year, the two Japanese riders raced for the Musashi RT Harc-Pro Honda squad and finished at the foot of the podium. British FIM Superbike championship racer Leon Camier rounds off the Honda trio managed by former MotoGP rider Tohru Ukawa, who holds the record for the most wins at Suzuka. Ukawa claimed five victories at Suzuka on a Honda: in 1997, 1998, 2000, 2004 and 2005. The other Honda in the spotlight is targeting the 2017-2018 FIM EWC title win. As the first-ever Japanese team in the running for the world title, F.C.C. TSR Honda France will be front and centre. The team has stood on the podium on eight occasions in Suzuka (thrice on the top step). Freddy Foray, Josh Hook and Alan Techer have two goals in the saddle of the Honda #5: winning the title and getting F.C.C. TSR Honda France another podium. The British team, currently 3rd in the FIM EWC provisional standings, is aiming to wind up the season on a positive note at Suzuka, but will have to find a new teammate for Sébastien Gimbert and Erwan Nigon. Gregory Leblanc will sit out the race due to injury. Having finished 4th last year at Suzuka, Musashi RT Harc-Pro Honda is keen to get back on the podium after its 2013 and 2014 wins. JSB1000 racer Ryo Mizuno finished his Suzuka 8 Hours debut last year in 10th place with the Honda Sakurai squad. This year he’ll be sharing stints on the Honda #634 with Moto2 rider Dominique Aegerter, 3rd-place winner last year with F.C.C. TSR Honda France, and FIM Superbike racer Patrick Jacobsen, who debuted at Suzuka in 2016. After finishing in 27th place at Suzuka last year following a 9-year absence, KYB Moriwaki Motul Racing is fielding the same line-up and hopes to once again feature among the front runners. JSB1000 racer Yuki Takahashi and four-time Suzuka winner Ryuichi Kiyonari will be riding the Honda #19. Dan Linfoot, a British Superbike rider for Honda Racing, is the third member of the Moriwaki squad. This team – the Suzuka winner in 2003 – has featured on the Suzuka roster since the start of the 2000s. After a 10th-place finish in 2017, this year Honda Dream RT Sakurai is fielding a combo of youthful talent and experience. 23-year-old Sodo Hamahara will be riding the Honda #72 together with former Grand Prix rider Shinichi Ito, 51, a four-time winner at Suzuka for Honda. Another noteworthy Japanese outfit, Au&Teluru MotoUp RT (12th at Suzuka last year) has also lined up a strong intergenerational trio to ride the Honda #090: Kosuke Akiyoshi (43, a three-time Suzuka winner) with two Moto2 racers: Tetsuta Nagashima, 26, and Spaniard Isaac Viñales, 24. Honda Asia Dream Racing is another squad to watch out for. The team, which finished 8th in 2017, has a line-up comprising Malaysian rider Mohd. Zaqhwan Zaidi, Australian Superbike champion Troy Herfoss and Indonesian rider Andi Farid Izdihar. 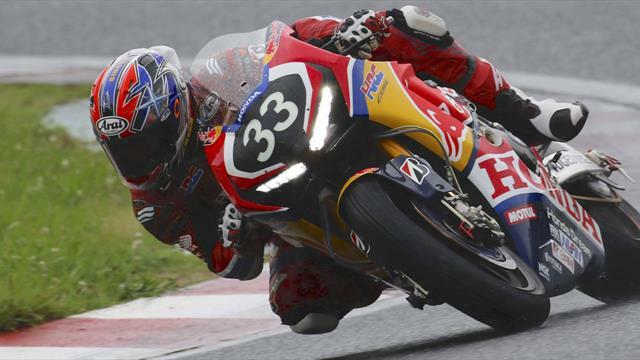 L’article Honda launches bid to reconquer Suzuka est apparu en premier sur FIM EWC.